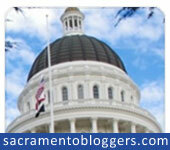 I recently took advantage of a special event invitation offered through Sacramento Bloggers. 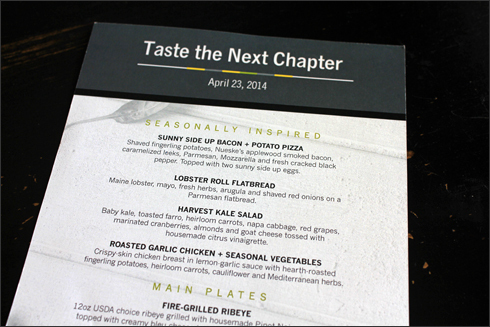 I had the opportunity to experience California Pizza Kitchen’s Next Chapter menu at Market Square near the Arden Fair Mall in Sacramento, CA. California Pizza Kitchen (CPK) is definitely a “go to” restaurant for my husband and I. He is a huge fan of their Original BBQ Chicken Pizza and I like their Thai Chicken or White Pizza and Waldorf Chicken and Italian Chopped salads. I was excited to step away from my usual order to try some new items. 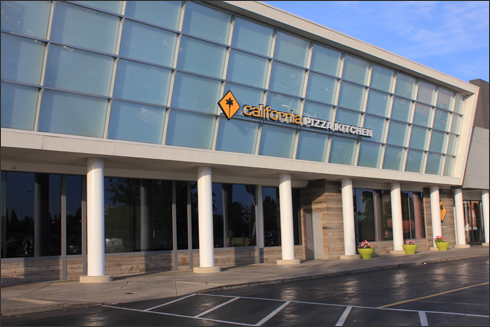 The first California Pizza Kitchen popped up in Beverly Hills back in 1985. 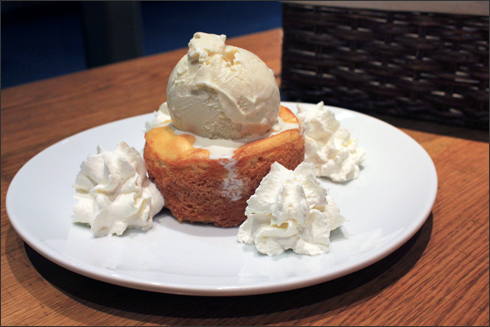 California Pizza Kitchen serves up authentic California-style cuisine and is known for its innovative menu items. CPK provides a range of California-inspired dishes, from signature hand-tossed, hearth-baked pizzas, to salads, pastas, entrées, soups, sandwiches and unique hand-crafted cocktails. The executive team at California Pizza Kitchen chose the restaurant near Sacramento’s Arden Fair Mall to debut the company’s new Next Chapter menu that includes many seasonal surprises such as the Sunny Side Up Bacon + Potato Pizza, Harvest Kale Salad and Roasted Garlic Chicken and Seasonal Vegetables – just to name a few. 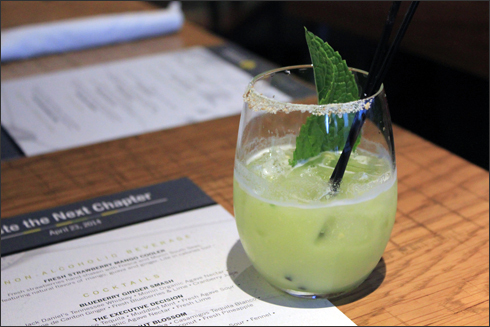 I joined a group of Sac bloggers in meeting Chef Brian Sullivan, California Pizza Kitchen’s Senior Vice President of Culinary Innovation, as he chatted with us and shared delicious new seasonally inspired menu items that went beyond their signature pizza. Brian was awesome. I thought it was cool that he took the time to chat with each one of us. He explained to me where they sourced some of their items and we talked a little bit about how the California drought was coming into play. We had a great conversation and I appreciated him taking the time to really interact with us before and after each dish came out. The entire restaurant staff went above and beyond to make sure we had everything we needed for the entire evening. I think I went through a dozen or more plates, forks and spoons. Chef Brian made the trip to Sacramento specifically for the debut of the new menu, which is the second phase in the Next Chapter transformation of this particular CPK location. The restaurant recently underwent a $1 million extensive remodel. The nearly 5000 square foot redesigned space now includes more seating in the dining area and at the bar. More bar seating and an extended menu is sure to connect with those who just want to grab a cocktail and a bite to eat with friends before or after a movie or shopping. 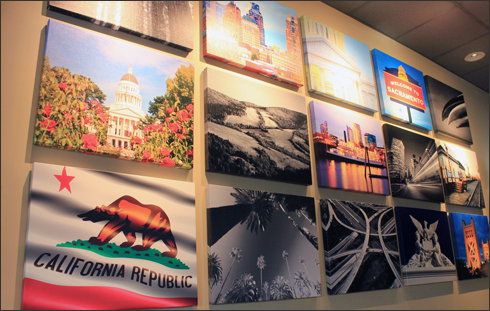 The new interior decor was spot on with the current style I’m digging here in other Sacramento based restaurants. Artwork depicting our city was a definite eye catcher. 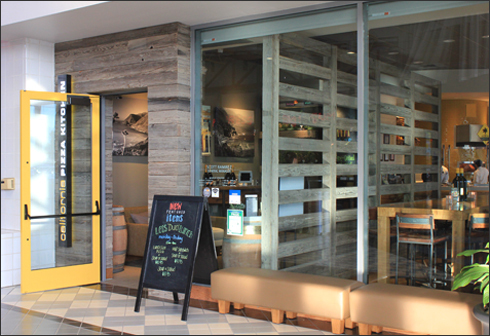 Unfinished, reclaimed wood is featured throughout the interior and exterior of the restaurant. I love the warm, inviting atmosphere it creates. The large windows were also a food blogger’s dream for photos. This is something I look at when selecting a restaurant – lots of natural light – unless of course it’s for a romantic dinner with the hubs or I’m with friends on a non-blogging adventure, then I leave the camera at home. Side note: As I keep seeing the use of reclaimed wood in restaurants, I’m leaning more and more towards creating a feature wall or furniture piece as a DIY project within my own home. I’ve been collecting photos for inspiration. I might try something in my office first. I’m guessing the warm vibe is how the 1970’s wood paneling craze came about. Although I do feel that reclaimed wood is different… sure it’s trendy right now, but I think it’s also about the history and sustainability – it tells a story. It’s also REAL WOOD compared to the faux/laminate wood direction the 70’s took. I’m not interested in creating a dark and dreary feel – a weathered look, yes – I just want to continue with my old vs. new decorating style throughout. The California Roots was my favorite drink of the evening – I never would have thought that avocado could have worked so well in a drink. It was very refreshing. I look forward to ordering this again on my next visit. 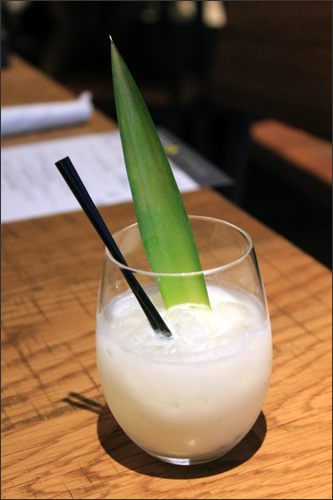 The Coconut Blossom was my second pick of the evening. I was immediately transported to memories of past beach vacations, I loved it! I had a great time at my table chatting with fellow bloggers as we enjoyed course after course from the new Next Chapter menu. 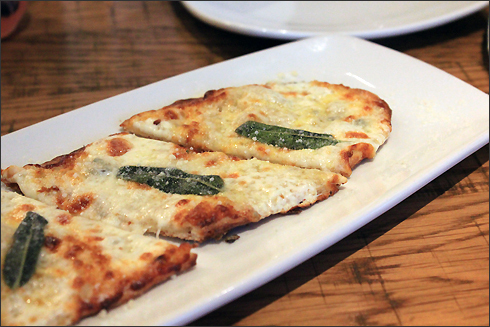 The Bianco was my favorite – when it comes to pizza and flatbread, I’m a cheese girl through and through. The sage was a pleasant surprise, I really enjoyed it along with my California Roots cocktail. 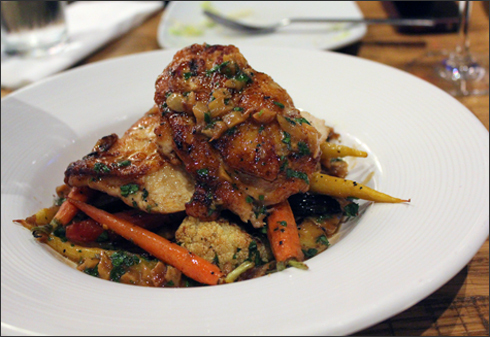 The Roasted Garlic Chicken + Seasonal Vegetables was my favorite dish of the evening. The heirloom carrots were cooked to perfection and a sweet balance to the roasted potatoes and well seasoned chicken. I wish I could have bottled the lemon-garlic sauce. 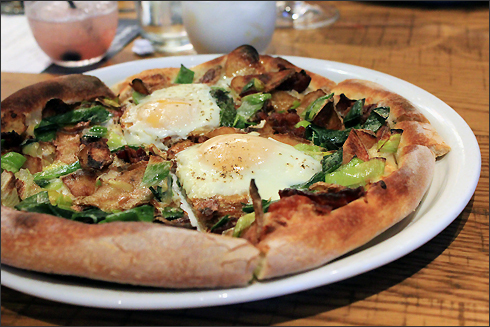 Another favorite was the Sunny Side Up Bacon + Potato Pizza – it should be known that I’m a huge leek fan and I love sunny side up eggs on salads, toast, English muffins, etc. Add fingerling potatoes and applewood smoked bacon into the mix, I would eat this pizza for breakfast, lunch and dinner. The Harvest Kale salad was tasty, the citrus vinaigrette was very tangy, but played well with the kale, farro, cabbage and goat cheese. 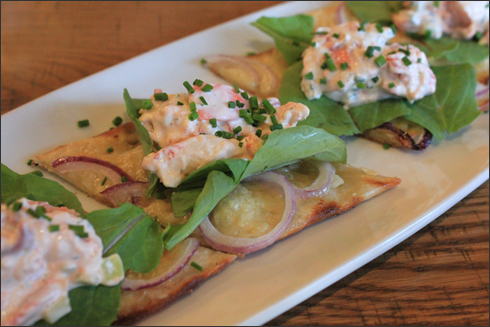 The Lobster Roll Flatbread was an inventive way to change things up from the standard roll. I liked the addition of the arugula. I was very full by the time the Main Plates came out, but that didn’t stop me from enjoying both. 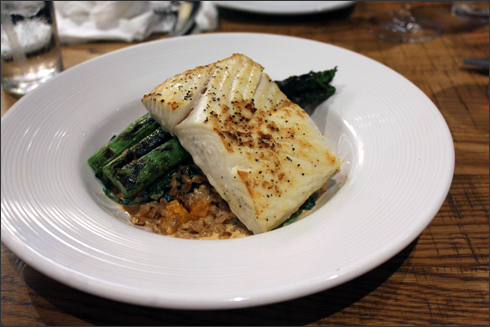 I love Halibut – the seasoning was perfect and the butternut squash really sweetened the farro making the combination pretty hard to beat. However, the Fire-Grilled Ribeye did just that. 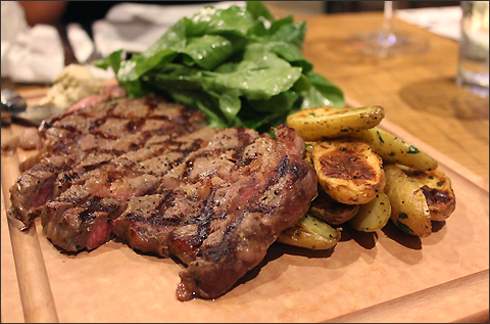 It normally doesn’t come sliced, chefs did that to make it easier on us bloggers to share. Four of us shared each dish. The ribeye was cooked to order (medium rare) and the creamy bleu cheese butter and Pinot Noir sea salt took it to the next level for me. I often overlook flavoring my butter, this was a reminder that it really can elevate a dish. The Salted Caramel Pudding was my favorite dessert of the evening with the Butter Cake coming in a close second. 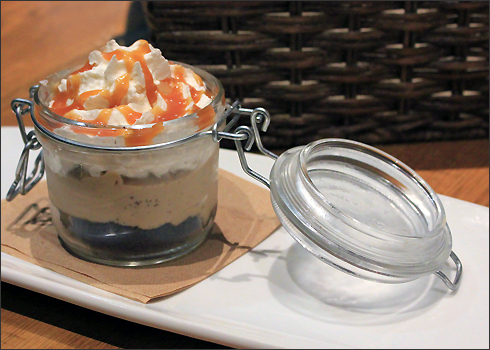 How I even found any room to get through one dessert is a mystery – they were just that good! 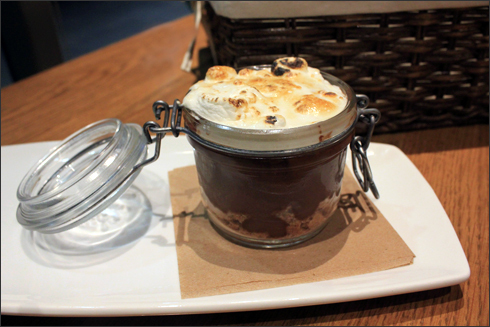 The S’mores will be a favorite among the young diners – it was rich, gooey and had “kid” written all over it. 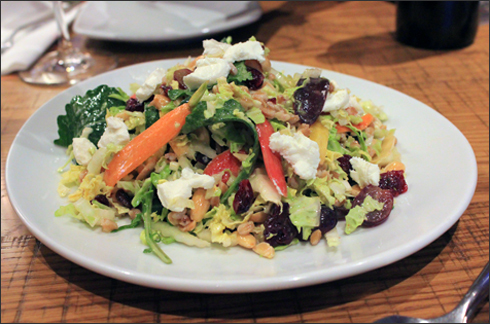 My take away for the evening was “wow” – CPK really has changed things up. Every food craving was satisfied. 16 courses and no need to eat for a week after… I had great conversations with other bloggers and couldn’t have asked for a more enjoyable evening. Many thanks to Chef Bryan, Scott, Lauren, Adrian, Gonzalo and the rest of the staff at California Pizza Kitchen for an amazing opportunity/evening. Disclaimer: My meal was included as part of the CPK blogger PR event. I was not compensated or required to write this post – all thoughts and opinions (as always) are my own. Holy cow! I had no idea that CPK had ventured beyond pizza!!! 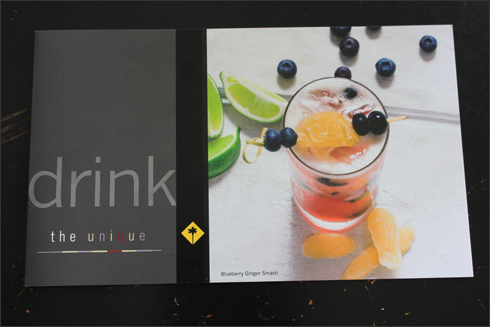 The new menu looks fantastic and just the thought of the coconut blossom makes me drool!!! Will have to make the trek up to Arden!!! They just keep getting better! Thanks for the info!